Displaying X-Axis' data for a time period vs. latest values. 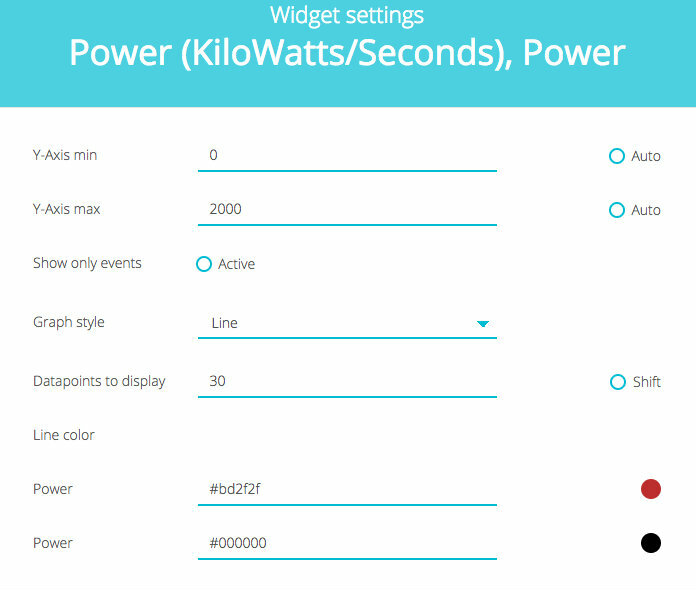 In all widget displays, clicking the sprocket icon will open Widget Settings. The Y-axis with a range of the maximum and minimum readings reached. The X-axis, which represents the readings' data frame. Please note that Educational Licenses may only display a maximum of 500 data points. Ubidots accounts can display the average of the last 500 datapoint and auto adjust based X axis length. Show only events inactive- once active, they display a horizontal line that highlights X- axis and Y-axis limits. Green and blue as default colors. Here you can adjust the different settings and parameters of your graphs to your likeness. Here is the result the same data as the Line Widget above but after data parameters and color settings have been changed. These customizations let you make your dashboards look unique to your desired colors, branding, or likeness. Pro Tip: If your devices are lecturing data each second, you just need to tell Ubidots to display the latest 60 readings for showing a minute spam, the latest 3600 readings for an hour, and so on. These settings are also available for double axis widgets.